I posted on the "Whatcher bought this week" thread that I had picked up a couple of Mirages that were sold as being in need a little TLC. As it turned out it was nothing major and the price was irresistible. This prompted me to look afresh at Falcon's output. Unsurprisingly the brand had its detractors but I for one was sorry to see them go as they were to my mind to military jets what Oxford is to props, in that they selected some less obvious subjects. I have a number of Falcon's releases and I think they stand comparison with the other main manufacturers pretty well - particularly bearing in mind the price point, and having briefly searched on the net for remaining stocks I suspect secondary market prices will remain robust. They are solid diecast and generally the fit is OK. On some models they were a bit gappy but then they were not alone - and are still not alone - in that respect. The paint finish in my experience was to a high standard. There were some standout models for me, the principal ones being the F9F, F11F, the T.33 and some of the Mirage releases. Not so good was the Fiesler Storch which, as released, because of the way the glazing was done, had a look of Mickey Mouse's mate Pluto about it. However I have found that this is redeemable by re-glazing so that the glazing panels are flush with the outside of the frames. Overall for me a case of the Joni Mitchells - you don't know what you've got 'till its gone. My favourite Falcon is the F11 - the sheer beauty of its pastel colour and fuselage/wings shape. Maybe also perhaps because the F11 was one of the first models I built as a boy. The T-33 is nice, too - if a little rough. And what choices are there? The extended rocket launcher on their F-86 damages it for me. Otherwise, there is not much choice on this one, except the Leo Models' 1/100 scale F-86K. That one is quite nice, actually (Their F-84F, too). What about the F-86D FA723007 - without the rocket pack but with sidewinders instead. I have this - it`s a beauty . I didn't even knew it existed....It does look nice. Like you, I was put off by the non- retractable rocket pack . And suddenly I saw one without - the markings actually kept the price low and it dumped for a while. I got mine back in October 2013, when prices were low. It comes up from time to time on ebay BUT not usually in Europe . I've recently grabbed a batch of T-33s (French, Greek, Spanish, Norwegian, Japanese, German, the USAF Alaskan one and a second RCAF silver one) at reasonable prices and they're displayed on a shelf with some Skymax F-84s. It makes for a very colourful display and, despite the fiddly landing gear, I like them. The F9F is a nice little model too and the Hawks are pretty good. You have to be careful with the Mirages as the one's based on the Mirage IIIE type airframe are horribly misshapen and look like throwing darts. 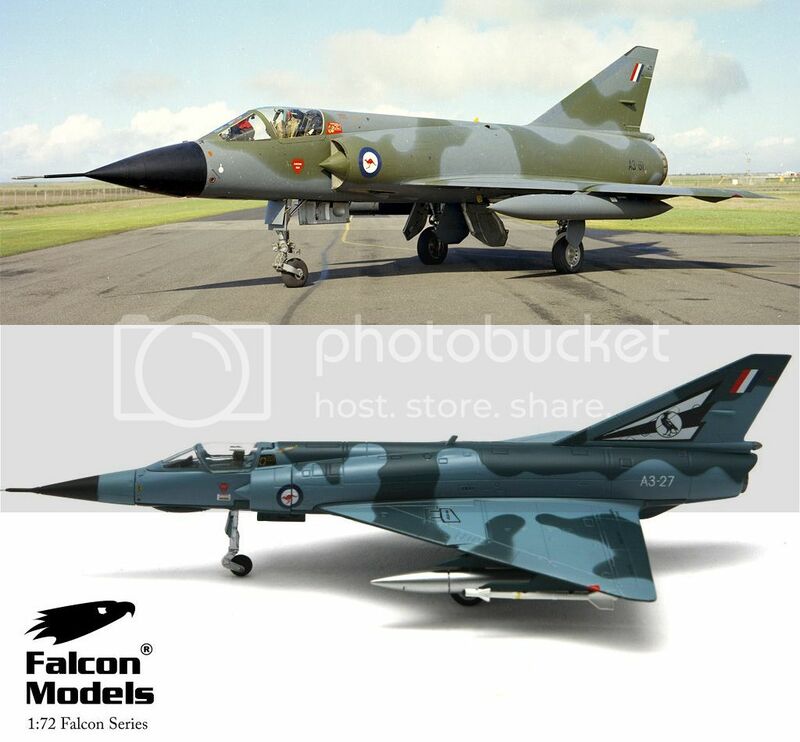 The Mirage IIIC based models look better though I don't have any. I aspire to be an MHIII Air Commode-er! 3 Falcon Models landed in my collection. First their 1st Swiss AF Mirage 3 release which was a nice but not special model. Second was the Dutch AF T-33 which I really like. 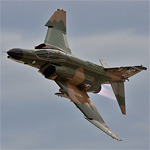 My favorite though is their Mirage F1CR. Well all their F1s look very good. I like the Mirage F1Cs too Richard, but they do have oddly compressed looking main landing gear. Not a game-breaker for me personally, just a minor niggle. There don't seem to be many of these around at reasonable prices right now. If at first you don't succeed........have you selected the right ordinance? I guess the question of a 'reasonable price' is open to interpretation. I am a big fan of them actually. I always thought their tooling selections inspired. Sergei's analogy comparing the manufacturer to Oxford is a good and accurate one in my view. The F86D was always my favourite tooling,....even with that frustrating rocket pack. I have four of them in hanger. The other big mention should go to the F9F and T33. Along with Skymax's F84, those types really did make a Korean War theme very very good indeed. I will still pick them up occasionally,....particularly if I can find room to expand on the French theme. Its a shame they went way of the dodo. There was a lot of talk with respects to the F84F and it was a tooling that I was most looking forward too. Quite right Roy, the MLG is not 100% but even on its wheels it does make for a nice model. I've got the green/grey CR, looking for that Chad/desert camo too. The SAAF Mirage F1AZ is also appealing to me, but I have only seen that in a museum in South Africa, and one outside the Denel factory at Johannesburg Intl Airport, but that was also a non-flyer. Their Mirage 3E in French AF green/grey camo is also appealing to me, but you say it has a lot of flaws? With the Mirage IIIE mold they tried to do something they could pass off as an air-to-air radar equipped IIIE or the much more pointy-nosed Mirage V without the air-to-air radar. The result is a far too narrow fuselage which looks very wrong for either type. I used to have the Argentinian Mirage/Dagger from Falcon but it irritated me enough that I eventually traded it in at one of the local shops. That's something I almost never do. The mold looks vaguely like a Mirage V with the pitot tube on the tip ala Belgian aircraft, but nothing at all like a Mirage IIIE as they've tried to pass it off. I was surprised how many Falcon Models I owned when I added them up - the Panthers and Tigers were great additions to my carrier deck, the Mirage 3 added to my Israeli and Oz themes and Hawks added to my UK and general trainer theme. Got the Beale and Taiwanese Talons and the Japanese Sabre. Added a couple of Kfirs to my Israeli and aggressor themes too. Favourite has to be the Tigers. Poorest - the Taiwanese Talon. I have to agree with Roy, unfortunately Falcon never got the overall shape of the IIIE variants right. They're much too emaciated in my opinion as well (see image below). I've got one of the Falcon Aussie IIIO releases (which was a version based off the IIIE), but that was because its the only choice in that scale, not because I particularly like it. Would love HM to have a go at the Mirage III series, its a shame the well known issues with Dassault will probably prevent that. From an importers look it was lack or communication from Falcon when it started to go wrong, and the QC was the worst I have ever come across other than X Plus. Still they sold in quite good numbers and the Fiesler Storch was best seller odd but true. We have just sold the last of our RAF Hawks, got some RAAF ones left and a Bae Aircraft. We only sell these direct not through our retail network as we cannot support the product with spares, but all are opened and check before despatch. Actually you might be right with calling it a Mirage V. That's a lot closer when you look at the pointy nose. Yes, it's a shame we may never see another Mirage aircraft in diecast. Not even sure if Falcon had permission to produce the model, couldn't see any reference to Dassault licensing on the box. Not like the Boeing reference on HM's boxing. So many airplanes, so little time.. Thanks Rhino, that illustrates the problem perfectly. In fact, I'd have nabbed all of Falcon's RAAF Mirages had it looked even close to the real thing but the fuselage is way too narrow. The Dagger just looked dopey on the shelf next to an Airfix Mirage IIIC! They really don't look much like Mirage Vs either for the same reason. They would; however, make good but very expensive throwing darts for pub night. :-[ I forgot about the Kfirs and they look pretty good though I don't have one of those either. As I mentioned earlier the Falcon Mirage IIICs look decent from what I've seen. It's a shame they so badly botched the Mirage IIIE/O types by trying to take short-cuts. Falcon's F-86D Sabre Dog seemed to be the best received by collectors. It certainly weighed a ton and the paint quality was better than most. Majority of the releases are seen below. California ANG F-86L was announced by Falcon, but they lost their toolings to their contract factory closure before anything could be released. Rocket pack removed on production version. I didn't realise there were two Japanese models! Working on the basis that you don'y know what you've got 'till its gone I have just ordered an F-86D from Hattons whilst I still can. It is one of the few Falcons that I did not have an example of despite the positive reviews and for GBP19.00 plus postage it makes sense!